When I pass statues from antiquity, whether in a museum or in the environment, my curiosity perks. Who were they? What were their names and how did they impact their world? Most were worshipped as mythical deities or emperors who were believed to have powers to effect an individual’s life. Whether their powers be good or bad, most everyone watched their step with all due respect. 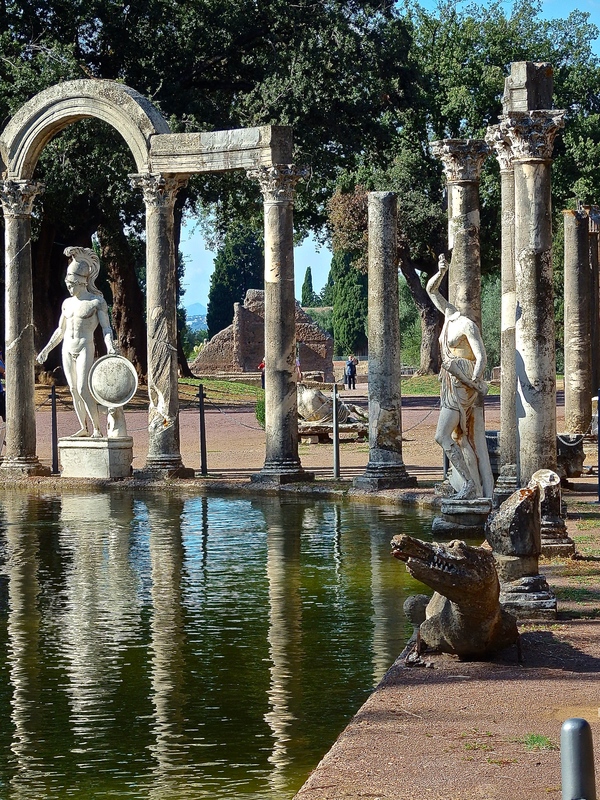 Villa Adriana, or Hadrian’s Villa, is just 18 miles east of Rome on the edge of the Sabine Hills. While strolling through the villa, I was amazed at the huge complexity. 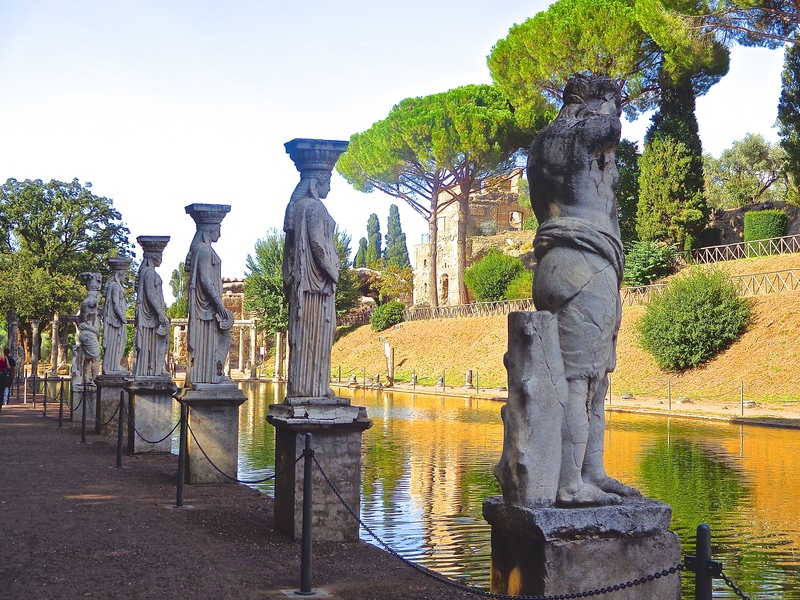 A long row of statues that lined an oblong lake, called the Canopus, still held stately reflections on the rippling water below them. These ghostly images, like echos from the past, seemed to signify the depth of immortality that these caryatids were thought to possess. The passing centuries haven’t been kind as some are missing a head or an upraised arm, or even gone altogether leaving empty spots. But a glimpse of the stunning overall effect still lingers. Emperor Hadrian had the sumptuous villa built beginning around 117 AD as a ‘country home’ of sorts. 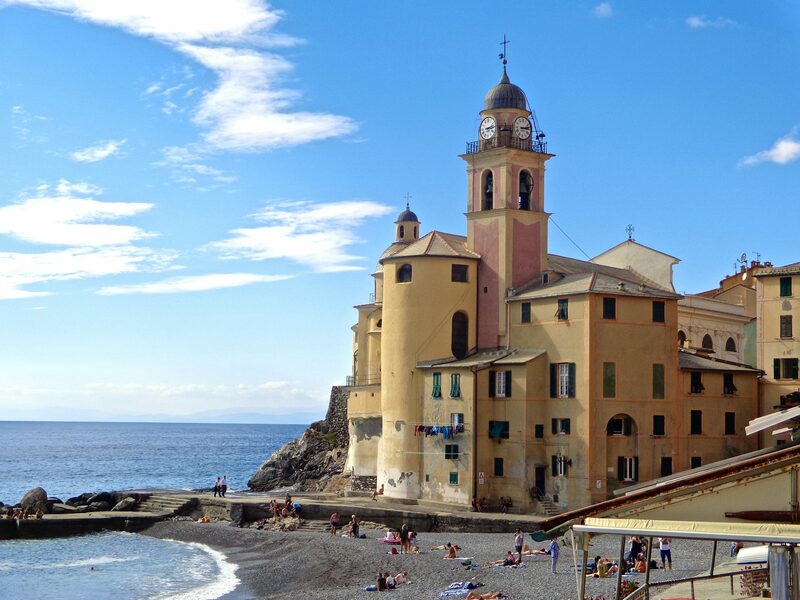 He escaped the political rat race of Rome often to this hide-out that became a tranquil sanctuary for him and his friends. Glorious banquet rooms, luxurious bathing facilities, and his own floating island where he could isolate himself for a time are just a few of the amenities Villa Adriana had to offer. Hadrian was a world traveler and architect. Spanish-born, he had a deep passion for the Greek culture and made attempts to replicate what he saw. The famous Pantheon and Castel Sant’Angelo in Rome are testaments to his grand architectural designs. 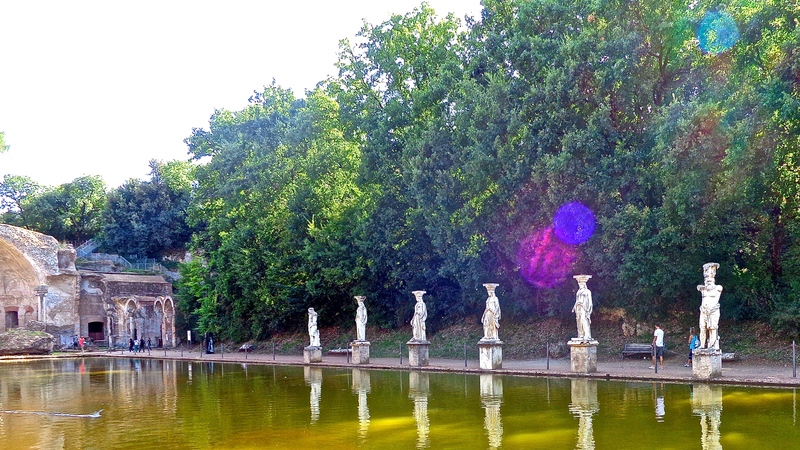 The lake was completely surrounded by statues of various deities that likely supported a huge pergola over the water. It must have been a breathtaking effect to look upon this green canopy. It’s easy to imagine small gilt rowboats skimming the top of the waters, escorting their passengers to a sumptuous feast or a moonlight pleasure cruise. Sadly, very little is left of this glorious vision of the past. Much of it was plundered over the centuries by barbarians and the marble burned to make lime. Greek god Hermes stands in the center with helmet and shield. Although these statues are replicas of the original, they look impressive. His villa was enormous and filled with copies of his favorite buildings from around the world. He spent the last ten years of his life here on his three hundred evocative acres. 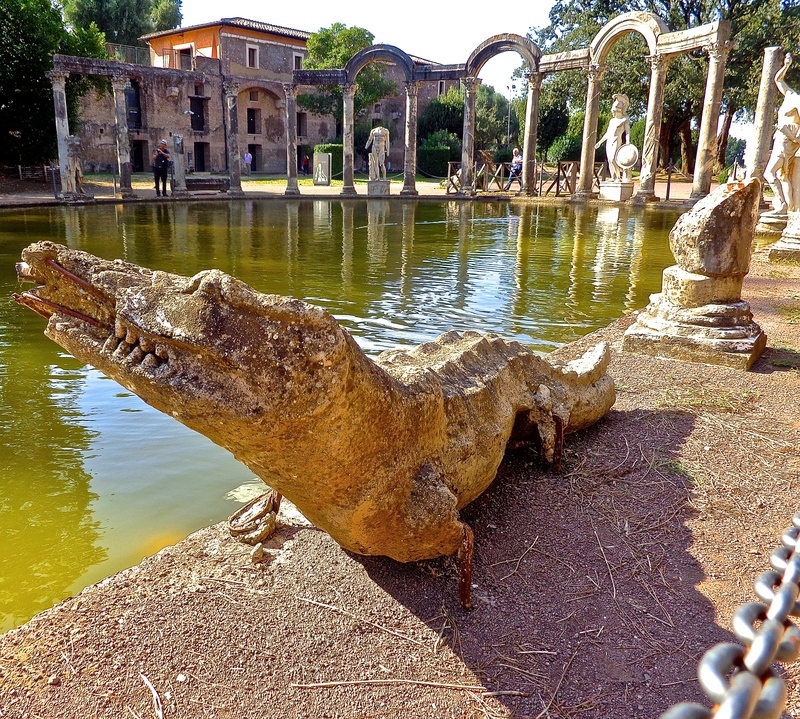 Villa Adriana expresses the lavishness and enormous power of ancient Rome. Historians and archaeologists today believe that the Canopus represented a branch of the Nile River in Egypt. At one end was a shell shaped grotto with fountains dedicated to the Egyptian god Serapis whom the Romans worshipped. Summer banquets and nighttime parties around the Canopus were famous for imperial excess. What remains of the temple of Serapis on one end can be partially seen to the left. The afternoon grew hot and I was ready to seek some shade after several hours of traipsing over ancient ruins. What once was a huge and undoubtedly elaborate complex is now just a shell of rubble. But for those with any imagination, it’s not hard to recreate the grandiosity of what once was the richest, most famous and stunning Roman villa in the world. Fantastic photos Susan. 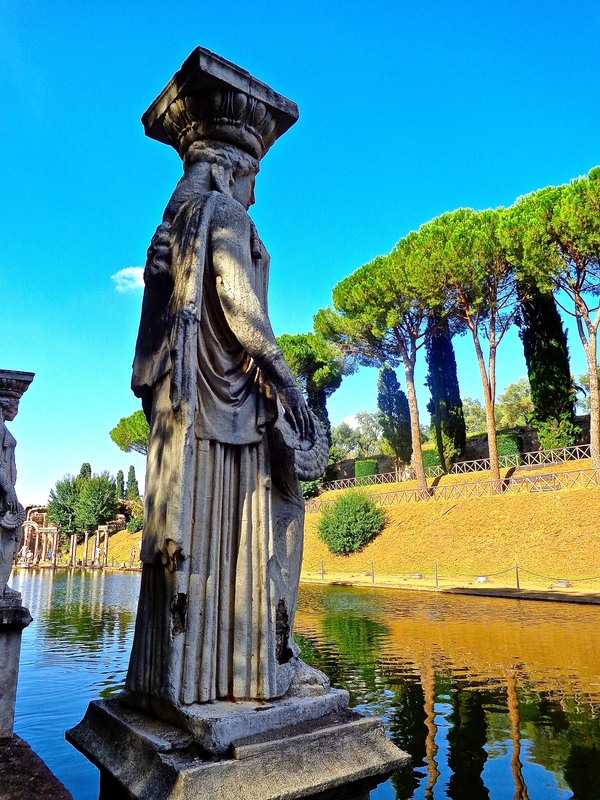 I haven’t been to Hadrian’s Villa and it’s one the places I will visit! Stunning photos. I haven’t been to Villa Adriana, but I would love to visit. Thanks Debra. It will take your imagination to piece it all together, but well worth it. Enjoyed reading. 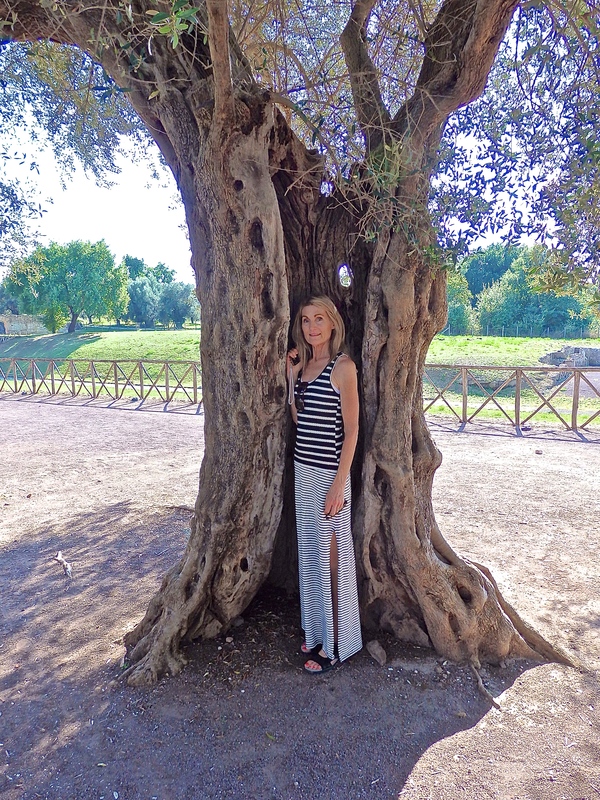 I have wandered Hadrian’s Villa probably 4 times; 3 on tours. By far the best was a splurge on my last trip to Rome. 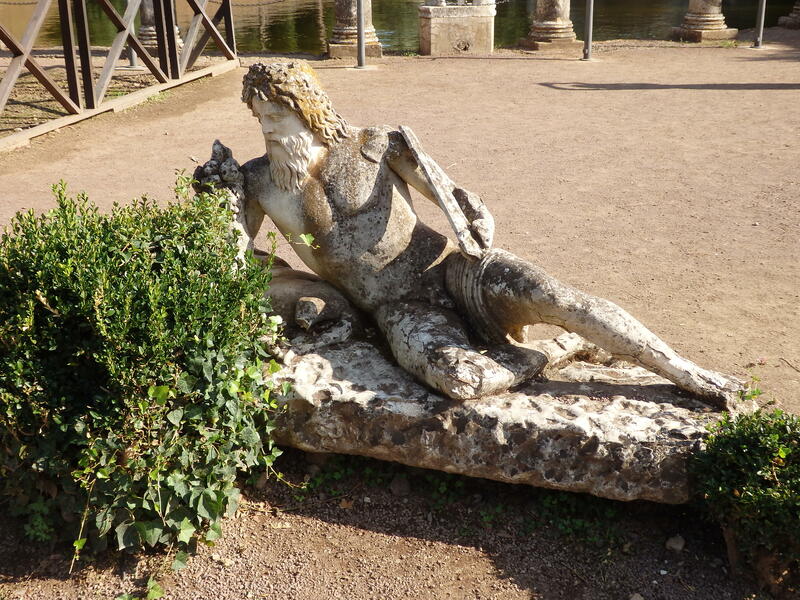 This was a guided private walk of Hadrian’s Villa and Villa d’ Este with its magnificant gardens. I hope to do this again in 2015. I have also enjoyed “Memoirs of Hadrian” by Marguerite Yourcenar and a a beautiful little book, “Hadrian’s Villa: between heaven and earth,” called a tour with Marguerite Yourcenar. The latter is from the book store at the Villa. Thanks for writing on so many of the places I love. Your welcome Joan. I love them too so always a pleasure! I will look for those books that you mentioned. Although I do a lot of research for my articles, I love to read books as well. Thank you…..always love to hear from you! I can see, Susan, where one could conjure up many imaginations on a stroll through the villa. So much history to explore and architectural talent to be seen. Enjoyed going along with you. I did, Susan. Looks to be an interesting place.